A jaunty romp through the history of the Golden Age of Music Hall. Directed by Jan Hunt of BBC’s The Good Old Days. 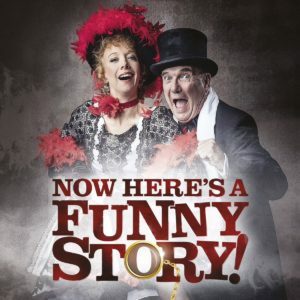 Now Here’s A Funny Story is a jaunty romp through the history of the Golden Age of Music Hall, sometimes revealing its dark underbelly. In a modern cabaret format, experienced Music Hall artists, Tommy Parsons and Elsie Bloom (Airlie Scott) take us on a musical journey from the very beginnings of Music Hall in the 1840’s, with traditional songs such as The Ballad Of Sam Hall and The Rat-Catcher’s Daughter, through to its 1890’s heyday with the likes of Marie Lloyd and Champagne Charlie, and on to wartime jingoism and the cross-dressing Vesta Tilley (“Britain’s best recruiting sergeant”) of the Great War before finally Music Hall suffers its relative decline with the advent of ragtime dance halls and cinema. A fun engaging and educational singalong entertainment! The show is directed by Jan Hunt of Paper Moon Theatre Company, The Players Theatre and BBC Television’s The Good Old Days’ fame. “Excellent entertainment with appeal for everyone…amusing, touching and rowdy!” Brian Dazley, Max Miller Appreciation Society. TICKETS: £10, £8 concessions, 1 free ticket for groups of ten or more. Please book and pay for your tickets via our Paypal account to ensure your place. We will send you your receipt and ticket reservation numbers by email.